Use what you have. Stretch your imagination. Remember its about the simple things. Katrina’s husband John has an incredible ability to create games and teachable moments out of virtually everything. 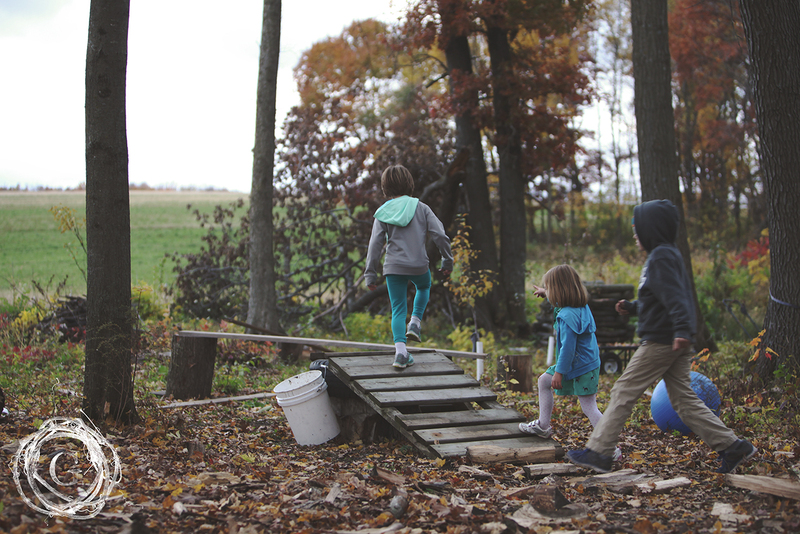 A few weeks ago, our families went camping on a woodland homestead in the woods in the Driftless region of Wisconsin. The nights were spent around the campfire, and the days were spent exploring. Our six kids built club houses and played tag and hide and seek. When their attention spans and good intentions were starting to run thin, John came to the rescue. 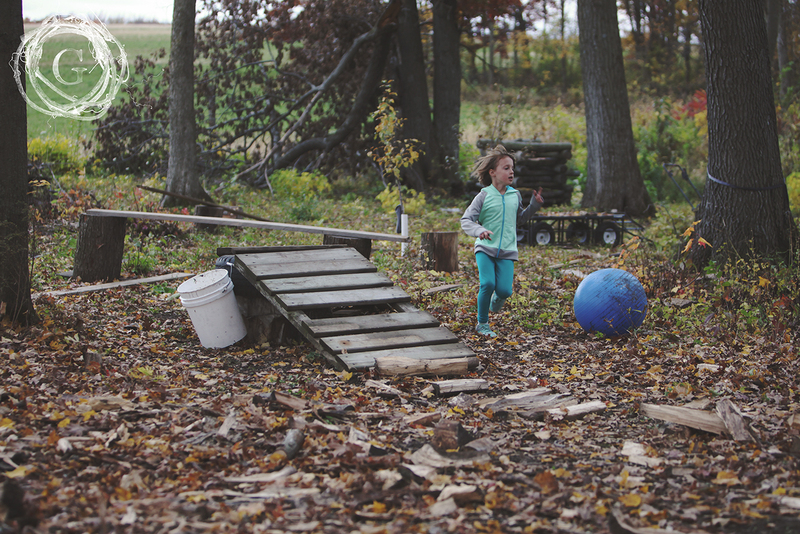 A Physical Education teacher and avid fan of Parkour, John set out to create a challenge course for the kids. He gathered the kids and taught them the valuable lesson of stretching before participating in any physical activity. Even with the range of ages (4 years to 9 years), Jon captured each child’s attention. We watched as he took scrap wood, tree stumps, and old tires to create a challenge course in less than 10 minutes. Spending no money, using what was available at our fingertips, he created a course that was challenging yet possible to complete for all the kids. Stay on course without falling off. You know what happened? The kids played and worked on this challenge course for the next THREE hours. Despite their shivering from the cold, we had to pull them off when it got dark because they were still having so much fun. The design was simple enough, with boards lying on the ground, or propped up against buckets and old tires. 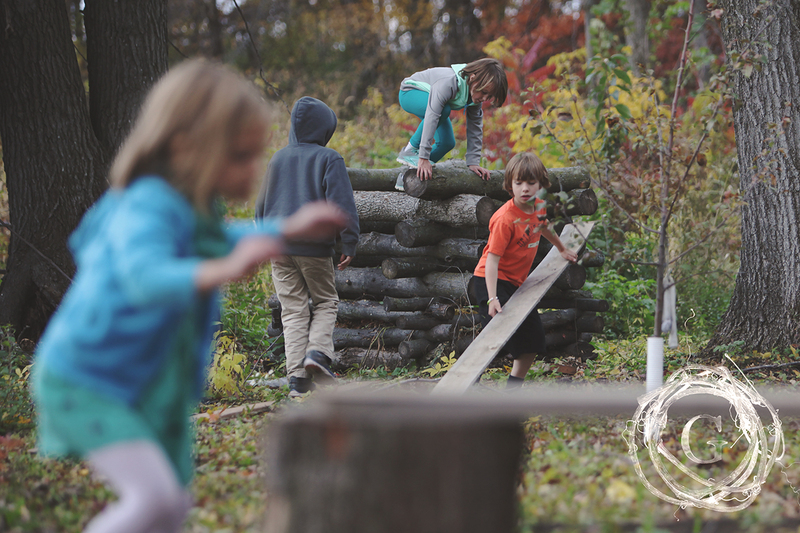 Even more than the simple idea of using what you have, this challenge course taught our children to use their creative thinking skills based on the foundation they were given. It gave them a launching point for their imaginations. When they had exhausted the original course, the kids would manipulate the layout and change the angles to make it easier or more difficult depending on their ambition. It was boards laid out on the ground. Used materials lying around. Nothing special. And yet this was one of the most memorable experiences of that camping trip. There is something inherently right about using materials that you already have. Using your imagination, you can create something out of virtually nothing. You know what’s even better than that? Teaching the next generation to do the same thing.